The colony that became the state of New Hampshire was founded on the division in 1629 of a land grant given in 1622 by the Council for New England to Captain John Mason (former governor of Newfoundland) and Sir Ferdinando Gorges (who founded Maine). The colony was named New Hampshire by Mason after the English county of Hampshire, one of the first Saxon shires. Hampshire was itself named after the port of Southampton, which was known previously as simply "Hampton". New Hampshire was first settled by Europeans at Odiorne's Point in Rye (near Portsmouth) by a group of fishermen from England under David Thompson  in 1623, just three years after the Pilgrims landed at Plymouth. Early historians believed the first native-born New Hampshirite, John Thompson, was born there. Fisherman David Thompson had been sent by Mason, to be followed a few years later by Edward and William Hilton. They led an expedition to the vicinity of Dover, which they called Northam. Mason died in 1635 without ever seeing the colony he founded. Settlers from Pannaway, moving to the Portsmouth region later and combining with an expedition of the new Laconia Company (formed 1629) under Captain Neal, called their new settlement Strawbery Banke. In 1638 Exeter was founded by John Wheelwright. The relationship between Massachusetts and the independent New Hampshirites was controversial and tenuous, and complicated by land claims maintained by the heirs of John Mason. In 1679 King Charles II separated New Hampshire from Massachusetts, issuing a charter for the royal Province of New Hampshire, with John Cutt as governor. New Hampshire was absorbed into the Dominion of New England in 1686, which collapsed in 1689. After a brief period without formal government (the settlements were de facto ruled by Massachusetts) William III and Mary II issued a new provincial charter in 1691. From 1699 to 1741 the governors of Massachusetts were also commissioned as governors of New Hampshire. 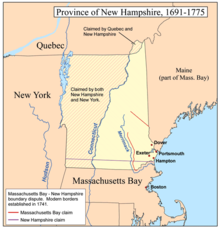 New Hampshire was one of the Thirteen Colonies that revolted against British rule during the American Revolution. The Massachusetts Provincial Congress called upon the other New England colonies for assistance in raising an army. In response, on May 22, 1775, the New Hampshire Provincial Congress voted to raise a volunteer force to join the patriot army at Boston. 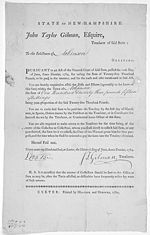 In January 1776, it became the first colony to set up an independent government and the first to establish a constitution, but the latter explicitly stated "we never sought to throw off our dependence on Great Britain", meaning that it was not the first to actually declare its independence (that distinction instead belongs to Rhode Island). The historic attack on Fort William and Mary (now Fort Constitution) helped supply the cannon and ammunition for the Continental Army that was needed for the Battle of Bunker Hill that took place north of Boston a few months later. New Hampshire raised three regiments for the Continental Army, the 1st, 2nd and 3rd New Hampshire regiments. New Hampshire Militia units were called up to fight at the Battle of Bunker Hill, Battle of Bennington, Saratoga Campaign and the Battle of Rhode Island. John Paul Jones' ship the Sloop-of-war USS Ranger and the frigate USS Raleigh were built in Portsmouth, New Hampshire, along with other naval ships for the Continental Navy and privateers to hunt down British merchant shipping. In 1832, New Hampshire saw a major news story: the founding of the Republic of Indian Stream on its northern border with Canada over the unresolved post-revolutionary war border issue. In 1835 the republic was annexed by New Hampshire, with the dispute finally resolved in 1842 by the Webster–Ashburton Treaty. ^ "The Contact Era". SeacoastNH.com. Archived from the original on 2013-12-12. Retrieved 2013-12-12. The largely unsung founder of New Hampshire is David Thompson (spelled "Thomson" by some accounts). Thompson's father worked for Sir Ferdinando Gorges of Plymouth, a most powerful English noble who had received the rights from King James I to set up the first two American "plantations" at Jamestown and Plymouth. ^ "NH Firsts and Bests". State of New Hampshire official website. Retrieved January 15, 2017. ^ Mara Vorhees; Glenda Bendure; Ned Friary; Richard Koss; John Spelman (1 May 2008). New England. Lonely Planet. p. 30. ISBN 978-1-74104-674-8. Retrieved 15 March 2011. ^ Lyford, James; Amos Hadley; Howard F. Hill; Benjamin A. Kimball; Lyman D. Stevens; John M. Mitchell (1903). History of Concord, N.H. (PDF). Concord, N.H.: The Rumford Press. pp. 324–326. Archived from the original (PDF) on 2006-03-15. ^ a b Bruce D. Heald, New Hampshire and the Civil War: Voices from the Granite State (History Press, 2012). ^ a b c d Mike Pride & Mark Travis, My Brave Boys: To War with Colonel Cross and the Fighting Fifth, University Press of New England, 2001. ^ a b Wilfrid H. Paradis, Upon This Granite: Catholicism in New Hampshire, 1647-1997 (1998), pp. 111-12. Federal Writers' Project (1938). New Hampshire: a Guide to the Granite State. American Guide Series. Boston: Houghton Mifflin.